So now you can! Without having to leave UK shores guests can experience a nail biting encounter with the ultimate sea predator in the Aquarium’s famed shark tank. Equipped with wetsuits and snorkelling masks, fastened hearts are sure to pound and stomachs flutter as swimmers come face to face with an array of schooling sharks! Q: Tell us a little bit about the sharks in the tank. What species are they and do you have a favourite? Jamie: The SEA LIFE London Aquarium has the largest variety of species in any Aquarium in the UK. We have Sand Tigers, Brown Sharks, Black Tip Reef Shark, Nurse Sharks a Bow Mouth Guitar shark called Betty and a Zebra Shark called Zoro! The sharks all have names and unique personalities! My favourite is Betty as she’s a really friendly shark who likes to come over and nudge up to me when I dive in the tank. Q: Are the sharks not dangerous then? Jamie: Sharks get a lot of bad press. More people are killed by faulty toasters, falling coconuts, rabid dogs and Hippos than they are by sharks. Our sharks are all really friendly. They live in harmony together and have never attempted to attack a diver. 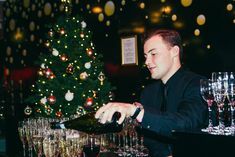 Q: At every event at the SEA LIFE London Aquarium guests are treated to a dive team entertaining them throughout drinks reception where they can ask them questions through the tank. What are the most entertaining questions you have been asked? “Why don’t the sharks eat you or the other fish in the tank?” – This is because they are fed 3 times a week so they don’t need to hunt for food. The fish in the tank are fast moving so the sharks are not interested in chasing them to be a snack! “Can I come in the tank?” this answer used to be a no, but now with the new ‘Snorkelling with Sharks’ experience you CAN experience it firsthand. 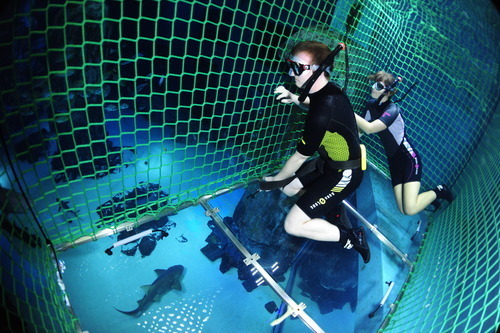 Q: Talk me through this new Snorkelling with Sharks experience? Jamie: This is a fantastic opportunity to get a face to face up close and personal encounter in the water with a unique mix of sharks. We’ve responded to public demand of people wanting to come in to the tank and we aim to challenge the perception of sharks as being dangerous animals. Q: Where is your favourite place to dive with sharks in the world? The best place I’ve been so far is the Maldives – I saw the most amazing display of mantra rays and Grey Reef sharks, but my ultimate dive would be the Galapogus Islands which has the most unique variety of species of sharks…. just like the SEA LIFE London Aquarium, but a whole lot warmer! You can have your very own free snorkelling experience with the sharks. 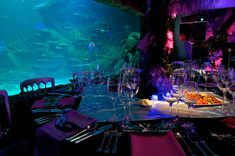 If you book an event at the Aquarium and quote ‘friend or foe’ you get a FREE snorkelling experience for two! Go to our Facebook page and enter the competition now! Competition closes Friday 6th July 2012. Rachel Bull, News Editor for Event Magazine was our first willing victim! Nerves built as she climbed in to her wetsuit and was briefed on her experience in the shark tank. To view this exciting shark encounter, check out the video on Event.